Red Hill has reached the halfway mark in its mission to create ten, one-off red beers to mark its decade of brewing on the Mornington Peninsula. 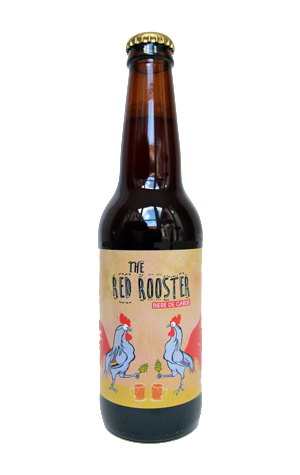 Once again, they look to Europe for inspiration, as they have for the previous four, with number five – Red Rooster – the third to take the beers of France / Belgium as a starting point. Having brewed a plum saison for number one and a red tripel for number two (which was also Brew 1000), this time around it's a biere de garde. This close relation of the saison is a farmhouse style beer that's typically maltier and darker yet still a place for the yeast's characters to come to the fore. They do just that here, in a lively manner, with those fruity, spicy esters rising from the cloudy, ruddy coloured beer in the glass. There's plenty of sweet malt and plum flavours in there, with the spiciness returning at the end. Beer six is also brewed and is a collaboration with Bright Brewery, carried out when the Red Hill family was in the snow for the winter season. While most kegs and bottles of Bright Red – a red Belgian IPA brewed with hibiscus – won't be released for a few weeks yet, a single keg has been snuck to The Alehouse Project and should appear as part of Hopfest 9.